Hit the open road with this practical and inspiring guide. In the first half, you’ll discover how to choose and customise your perfect van, and get it fitted for sleeping, cooking and storage. In part two, we’ll tell you how to stay safe, save money and park legally, then share the best road trips around the world, complete with awesome itineraries. 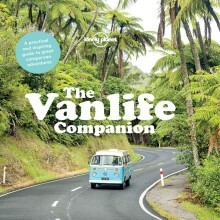 Lonely Planet’s The Vanlife Companion is a great introduction to the global #vanlife phenomenon and is geared to helping you have amazing adventures of your own, whether you’re building a van from the inside out or renting one for the trip of a lifetime. We feature 20 classic campervan routes to fuel your wanderlust and hear from people about how they got started and life on the road.